This section shows how we finish boats. There are many other methods you could use. If you already know how to fill and paint a boat you might skip this section. All of Ray's designs (with the exception of the Avalon 8.2) have chines. The panels are taped together or in some instances the glass is wrapped over the panels and chines in one operation. If you have used peel-ply over the taped chines on the outside then the weave of the glass should be full of resin. If you have made your own panels using peel-ply then the weave should be mostly full of resin as well. 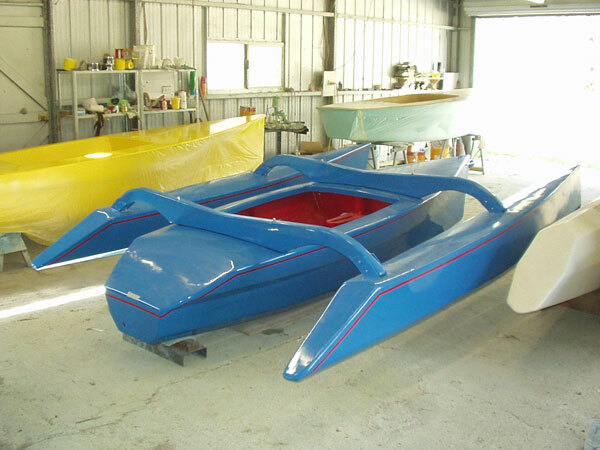 If you are building with plywood, filling the boat should not require too much filler either. First sand the boat to remove any dirt and stray blobs of resin. Paint a light coat of resin, if using polyester don't wait too long before adding the filler coat. The resin can harden quickly and leave brush marks which are hard to remove. The best way to a good finish is to apply filler to the depth of the tape with very little filler on the tape itself. We use Q-cells mixed with the resin, either polyester or epoxy. it is easy to apply, easy to sand, can be used beneath the water-line and is inexpensive. We use drywall tools, a 10" spatula covers a wide area smoothly. 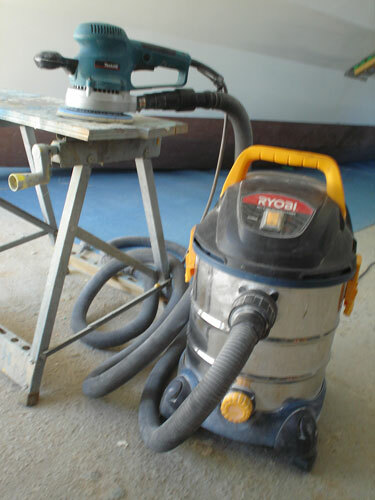 We sand the boat using a random orbital sanded hooked to a vaccum system to cut down on the dust. When the boat is sanded you will be able to see through the bog slightly. 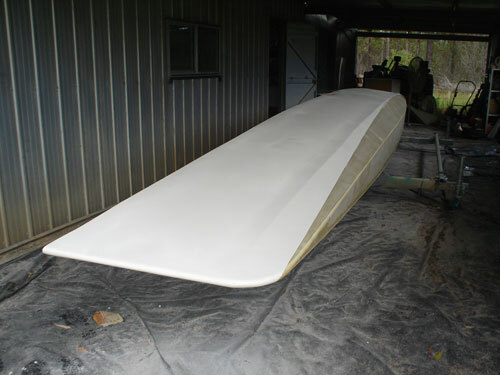 The boat is now ready to be primed. We use Jotun Penguard high build epoxy primer. We spray in on with an airless sprayer. The paint is thick and we haven't had much luck with a conventional spray gun. We spray primer twice. After the first coat we sand the boat and fix any imperfections which are only visable after the boat is painted. Any pin holes which are hard to fill can be filled with Septone blade putty (the putty must be sandwiched between layers of epoxy primer). The boat is sanded and primed again. When the primer hardens the boat is sanded and cleaned thoroughly ready for a finish coat. 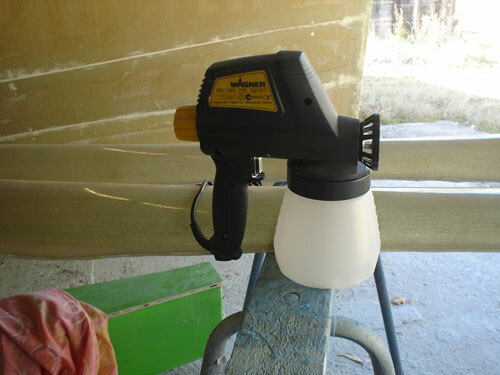 We use gravity feed gun with a 1.4mm nozzle and Jotun Imperite, a two part polyurethane. The first coat is a light coat which is allowed to tack off about 15 minutes. This prevents the paint from running. Then spray on two more coats. If you prefer to paint with a roller or brush follow the directions on the label.